The High Carbon Stock Approach is pleased to announce the launch of its Theory of Change and Global Strategic Business Plan. In the effort to prevent deforestation, HCSA’s accomplishments have played a critical role to date. As of October 2018, close to three million hectares of HCSA assessment area has been registered and over 500,000 hectares of HCS forests have been identified, set aside by companies for non-development and are in the process of being secured for conservation. 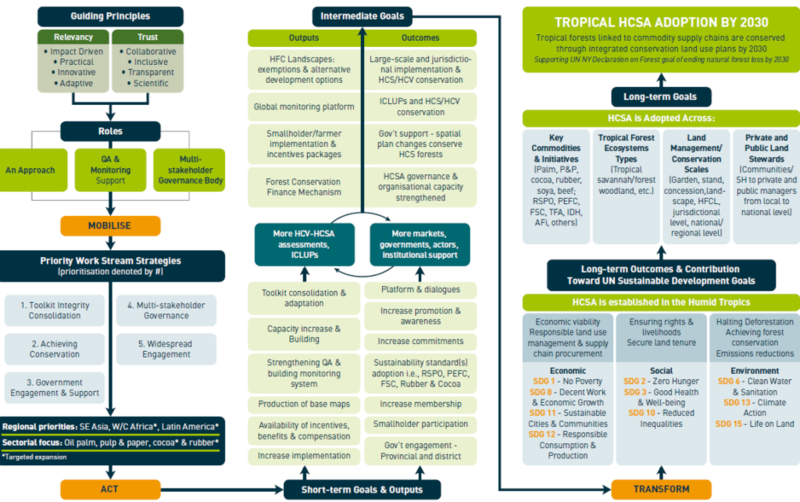 After 12 months of consultation, the Theory of Change (ToC) will provide a roadmap for HCSA to broaden its adoption, impact, achieve and supplement its ‘Tropical HCSA Adoption’ goal and the UN New York Declaration on Forest goal of ‘Ending Natural Forest Loss’ by 2030 respectively. The ToC identifies five main priority workstream strategies that will direct how HCSA should address the gaps and drawbacks of the implementation to date, build upon its strengths and seize opportunities for broader implementation and adoption. The ToC short-term strategic goals and priorities are detailed under the mid-2018 – mid-2021 Global Strategic Business Plan. HCSA will work through collaborations and partnerships with key initiatives, governments and organisations across several regions and with sectors to pilot and adapt its implementation, expanding its reach and impact. To know more about what HCSA has been up to, have a look at our Summary Progress and Highlights brochure. For more information, contact the HCSA Secretariat at info@highcarbonstock.org.